Tymal Mills grabbed his best NatWest T20 Blast figures of 3 for 30 to help Sussex hold off a late charge by Gloucestershire and win by six runs at Hove. It was Sussex’s first victory of this season’s competition, following their opening night defeat at Kent on Friday, but the Sharks were made to sweat near the end when Jack Taylor and Tom Smith took 32 runs from the 17th and 18th overs to bring the runs required equation down from 51 off four overs to just 19 off two. But seamer Ollie Robinson held his nerve with a fine 19th over, in which he had Smith caught in the deep for 16 and conceded only four runs. Fifteen were now needed from the last over and fast bowler Mills, called up to bowl it, fired a thunderbolt through Taylor’s desperate swing with his first ball and clipped the leg bail. 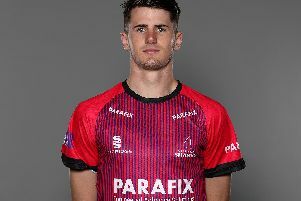 Taylor had hit two sixes and three fours in 36 from 20 balls, but it was not quite enough to pull the game out of the hat for Gloucestershire, whose last pair of David Payne and Matt Taylor could only take eight runs from the final five balls of Mills’s over. Gloucestershire lost Chris Dent to the first ball of their reply, leg-before to Steve Magoffin, and the same bowler had Ian Cockbain caught at mid on, from a mistimed pull, in his second over. Hamish Marshall did his best to resuscitate the innings from 8 for 2 with nine fours in a breezy 45 off 26 balls, but the Sussex bowlers worked their way steadily through the Gloucestershire batting with leg spinner Will Beer impressing with 2 for 26 from his four overs. Mills bowled James Fuller in his first over and later castled Geraint Jones for a spirited 25. Mike Yardy also took out Peter Handscomb’s middle stump with a low-slung left-arm dart. At 117 for seven Gloucestershire looked out of it, but Taylor drove Robinson over the long off boundary and Magoffin straight for another six. Smith also flicked Magoffin over mid wicket for six as 19 runs came from the 18th over. Sussex, however, regained control of things just in time through Robinson and Mills. Earlier, Sussex were given a decent start by Chris Nash and Mahela Jayawardene, who both scored quickfire 43s, but their later batting could not build on it. Luke Wright uppercut James Fuller to third man in the second over before Nash and Jayawardene added 81 in nine overs to set up Sussex for what should have been a challenging total. That they did not get it was largely down to Smith, with the slow left-arm spinner taking a T20 career-best 3 for 23 against his former county, including a spell of three wickets for six runs in 10 balls. Jayawardene and Craig Cachopa were bowled through attempted slog sweeps and Nash well held by Marshall diving forward at deep square leg from another sweep that the batsman did not hit properly. Nash pulled David Payne’s left arm seam for six and picked up a good length ball from Matt Taylor for another six either side of taking fours from the same bowler, while Jayawardene lofted Smith over cover for six from the last ball of the batting powerplay. Jayawardene also hit six fours in his 30-ball knock while Nash batted 33 balls and departing two balls after he had called for Wright to come out to act as his runner, due to a leg muscle strain. Cachopa had struck Jack Taylor’s off spin for two successive sixes and made it a third six in three balls, with a further maximum off Smith, before missing another violent stroke at the next ball. Ben Brown could only make 8 from 11 balls before being deceived and bowled by Payne’s slower ball in the 17th over but at least Beer pulled sixes off both Fuller and Payne as he as Matt Machan added 37 in the final few overs to give Sussex something to defend – and, in the end, just enough to see off Gloucestershire. Sussex’s new T20 captain Luke Wright said: “Tymal is only just back from injury and he had to bowl off a shortened run-up today. But he has still got pace and, in Twenty20 cricket, pace gets wickets. The only way to stop teams getting big runs is to take wickets and that is why it is exciting for us to have Tymal in our side this season. “We feel we can mount a T20 challenge this summer but it was crucial for us to win today having lost down at Canterbury against Kent on Friday night. We did a lot right today but we were still not as good as we can be, or would like to be, and hopefully this win can start to give us a bit of momentum.